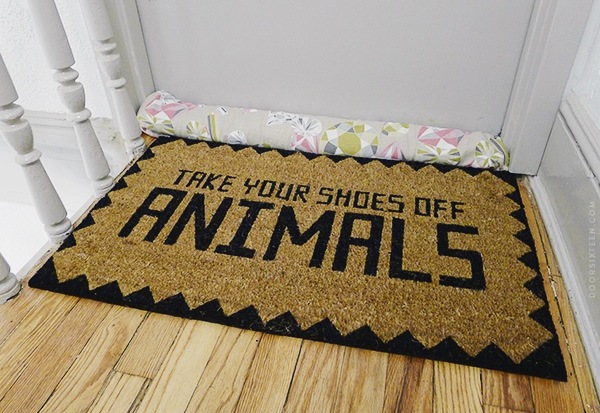 About four months ago, I spotted the perfect doormat: TAKE YOUR SHOES OFF, ANIMALS. OK, almost perfect. That missing comma is bothersome, but I can look past it for the time being. If I find myself losing sleep over it, I can always paint one in. I waited a day or two before ordering the doormat, and the next thing I knew, it was on back order. So I procrastinated some more, and then I missed the in-stock window, and then it was on back order again—yadda, yadda, yadda, the doormat was finally delivered today. Yay! I was originally thinking I’d put it on the porch at the house, but that door is ginormous, and this doormat would look too dinky there. At the new apartment, though, it’s just right. And yes, it’s now on back order again until next month, but if you like it, learn from my mistake and just order it now. I made that cute draft python five years ago, and it’s still going strong. I don’t know what it is about New York City apartment doors, but they all seem to have massive gaps under them. Without this draft python, the dogs would spend their entire lives peering under the door waiting for the guy down the hall to walk out of his apartment with a plate of sausages, so it’s essential. I still really love that fabric. It was designed by Maria Vinka for IKEA’s 2007 PS collection, and I’ve been hoarding a bunch of it since then. As long as I’m out in the hallway, I might as well take a picture of the common stairwell. This is a newly-renovated, late-1800s, three-story building, and I really like what they did out here. 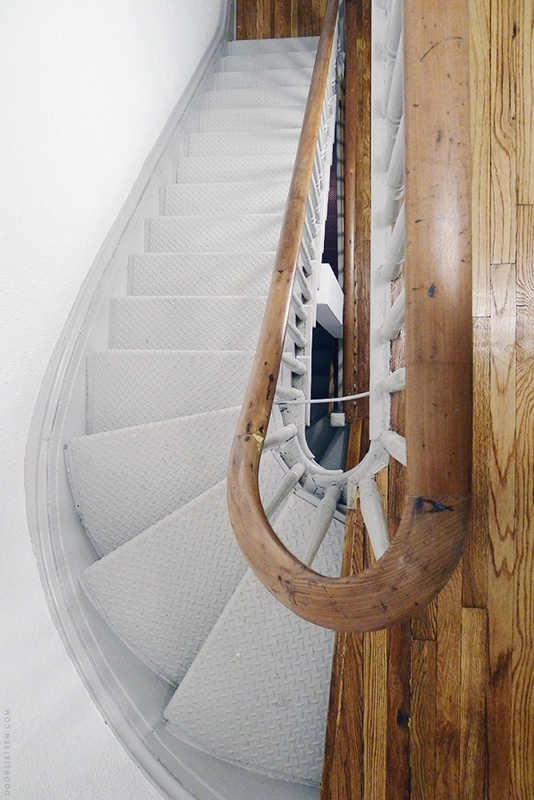 They refinished the original wood floors, stripped the banister, painted everything pale gray and white, and generally did a very nice job with the whole thing. I especially like the steel treads they put down on the stairs. 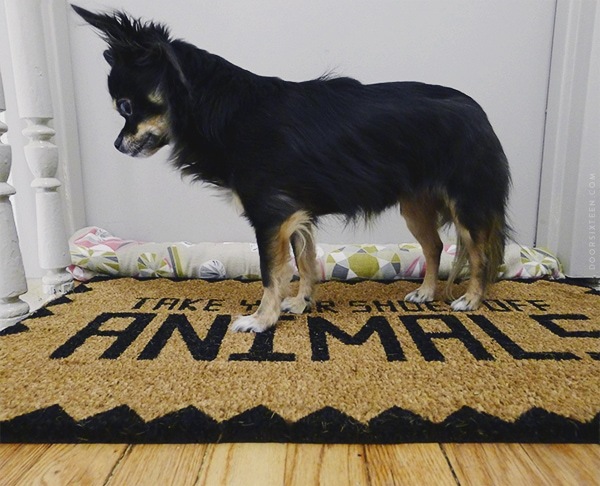 Fritz would like you all to know that he is an animal and that he doesn’t even wear shoes, so he doesn’t understand this doormat at all. Especially since it’s missing a comma. I love that you noticed the missing comma. I did, too. Once a copy editor, always a copy editor. 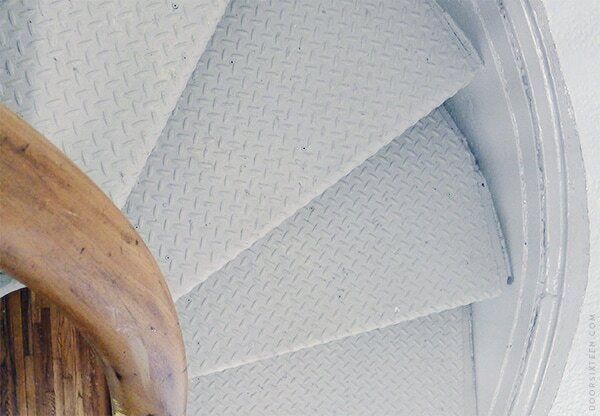 Oh my, I think I love the staircase even more than the doormat. 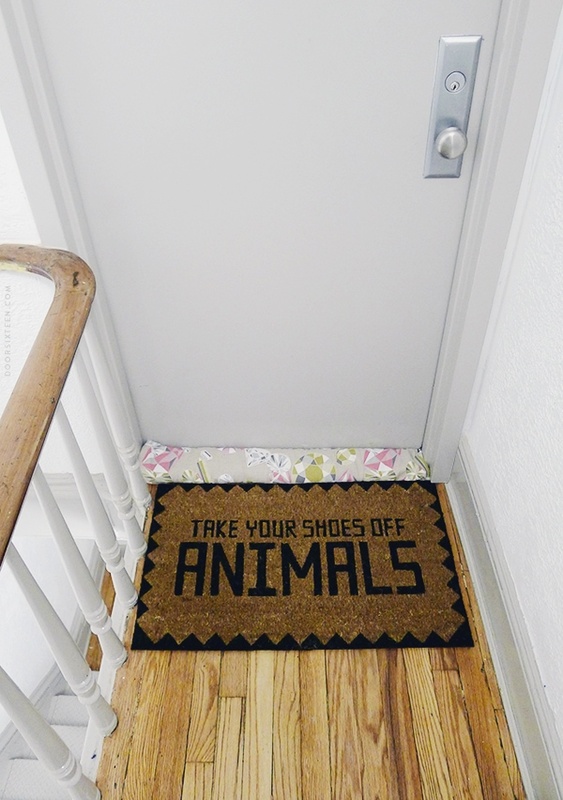 I suppose without the comma the doormat means if you’ve put your shoes on any animals, take them off them! 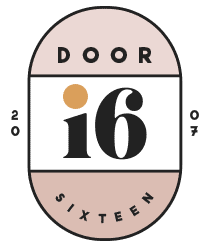 I live in France and recently learned they call those door pythons “boudin de porte”, meaning door sausage. Cracked me up. Still looking for the perfect one and cringing at the rolled up beach towel every time I walk by the door! I think I’d have to take a Sharpie to that thing to remedy the missing doormat. The constant (and false) reminder that some animals are out there parading around in my shoes would be too much to bear. Hahahahahahahahaha. This, all day long. I made draft stoppers for several of my interior doors but I sew a seam down the middle, lengthwise (making a sort of double tube effect) and then slide it under the door so that it moves with the door as you open and close it. It doesn’t work as well with a threshold though so I’m not sure it would work in your situation but it’s nice to have the convenience of not having to fix the draft stopper constantly. Anna, Anna, finder of the best things. Actually it was the last photo of Fritz and your comment that did me in. On one hand, I really *love* the look of leather, suede, cowhide, sheepskin, etc., but have not purchased any since becoming vegan a few years ago, so this seems like it could be a brilliant, cruelty-free way of having my house look more like Morgan Satterfield’s (lol). On the other hand, it seems like it would be a constant reminder that there are real cowhide rugs, and feel like taking advantage of a loophole… or something. So, I really want to know, what are your thoughts are on this? Hi Alicia! My thoughts on this are…all over the damn place, frankly. I bought a cowhide rug during my pre-vegan*, post-vegetarian “meat rumspringa,” and I have since given it away as its presence in my home made me too uncomfortable. I do still own a large, beautiful sheepskin, though, which I have decided to hold on to since my dogs (the two most important animals in my life) absolutely love snuggling up on it. As long as they’re getting something out of it, it stays. And, of course, I have wool rugs and wool sweaters and leather shoes, so where do you draw the line? Am I OK having a well-rounded selection of quality leather shoes that I can repair and continue wearing indefinitely? Or is it better to buy faux-leather shoes that are (often) less repairable and (often) made in factories that are environmentally and ethically questionable? I think I lean toward the former option, especially now that a lot of my shoes are going on more than a decade of wear. It’s a tough topic, and not one that I claim to have all of the answers on. Hell, I don’t even know if I have a clear opinion that I’m comfortable with myself—every purchase is its own decision. *FWIW, I don’t actually like to self-identify as “vegan.” I have a totally vegan diet, yes, but I think that saying you’re vegan carries with it a commitment to an entire lifestyle that I haven’t fully made. Out of respect for people who have, I avoid wearing that badge other than in certain situations (ordering food in a restaurant, for example). Well said, Anna! You’re right, it’s really not violating any kind of ethical loophole. And since it’s not, it’s a personal call. I have an Ikea faux sheepskin that doesn’t bother me, nor do faux prints/materials in fashion. I love faux meat, and am always looking for it to taste more *real* (the taste of vegan food is not why I am one). “If you’re going to look at that rug and see it as an animal skin, let it go. There’s no shortage of beautiful rugs out there that don’t look like dead animals, after all.” That’s exactly it, and the look of the faux cowhide may provoke in me a stronger response than the other examples I just listed. 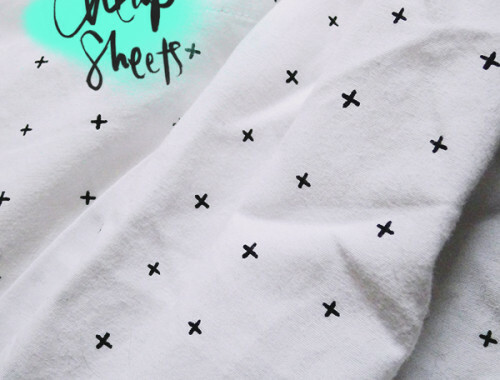 I’m happy that UO has made this product though! I think it’s a great alternative, and maybe a proliferation of the fake ones can lessen the demand for the real ones. There’s no real reason why anyone *needs* to kill a cow for a rug in this day and age, right? I love the fabric used for the door breeze stopper thingy! I wish Ikea would make it again. 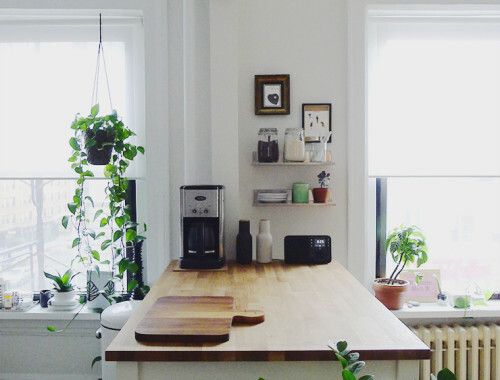 Everything is looking good at your home! Anna, I’ve been a longtime reader. A few years ago, I commented that I have the same Orla Kiely wallpaper that you have in your vestibule. I STILL haven’t hung it. I foster dogs in my spare time and was asked to take in one of several dogs rescued from a Lancaster puppy mill back in 2013. After hearing about them, I requested the long-haired chihuahua because, you know. Fritz. A long story short, a long-haired chihuahua named Zoey now owns me. She looks very much like him but I can’t figure out how to attach her photo so you just have to trust me on this one. That’s sweet, Robin! 🙂 Fritz says hello to Zoey. Cute mat! I don’t think I’ve ever seen such a clean apartment hallway before, especially with banister like that. It looks like a big house. I never needed one of this draft stoppers at the door, but would for sure use one if needed! Just think of all the energy being lost through this. Every months more and more homes around me have an energy certificate where you are informed if the window is old and you will loose the energy etc. I do put much effort to save ressources…. I’ve always wondered, how do the dogs do with the multiple homes? Did they take to it right away or did they get anxious? Do you have duplicates of certain dog toys or do they play with different ones depending on what city they are in? No troubles at all, Catherine, fortunately they’re very adaptable! Of course there’s been an adjustment period each time we’ve moved to a new apartment (new sounds, etc. ), but they’re good sports about it. I love the doormat (and the draft python), but man, I feel you on that comma. There’s an advertising campaign on Philly public transit called “Dude it’s rude” to encourage people to behave better (e.g. dude it’s rude, move your bag). I totally love it, EXCEPT FOR THAT GODDAMN MISSING COMMA, which drives me insane. I would paint one on the doormat. 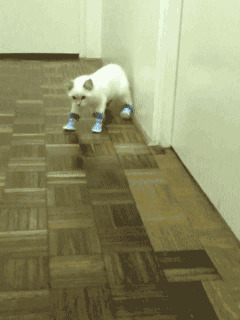 I don’t like to use the word (or feel the feeling of) “hate”, but I do hate when people put clothes and shoes on animals. I am thinking that doormat is saying it right without the comma. and i get why it could use the comma, too. 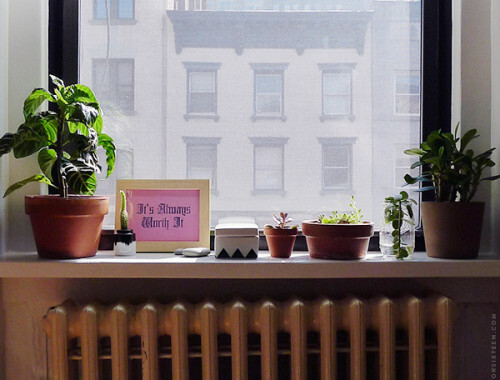 not just in sloppy wintertime, but also sticky summertime (eck).